Dipladenia is a richly-blooming hanging vine. Caring for this plant, from planting to pruning and including watering, will give you magnificent flowers in summer. 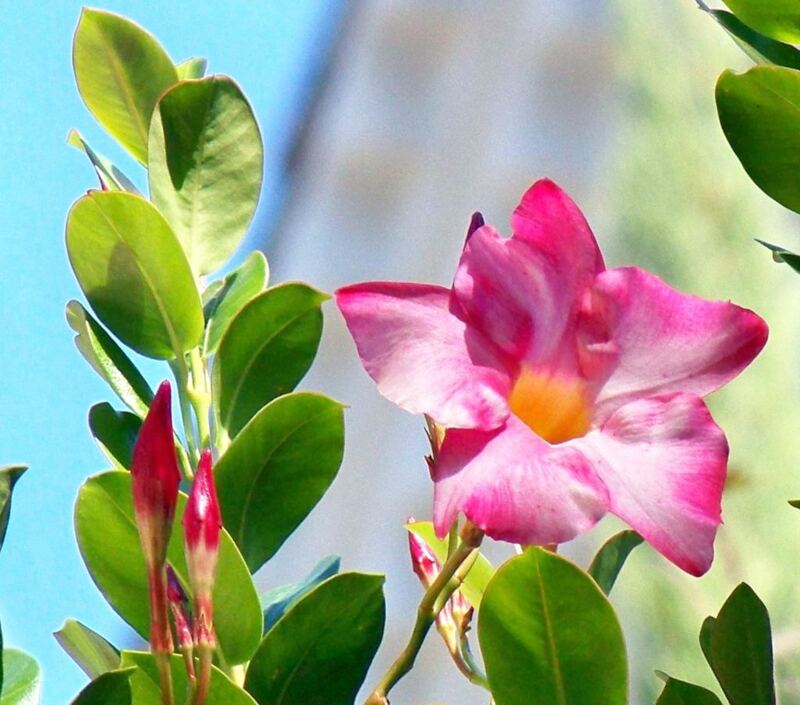 Follow our advice and your Dipladenia will bloom magnificently! Dipladenia usually is an indoor plant in temperate climates. 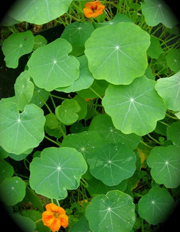 However, it’s possible to grow it outdoors as an annual in places where the weather is too cold. If potted, it is advised to repot every 1 or 2 years, preferably in spring. The container that was provided upon purchase is often too small to last more than a season. Repot your dipladenia as soon as the blooming is over. Best place your indoor dipladenia near light, but not in direct sunlight. 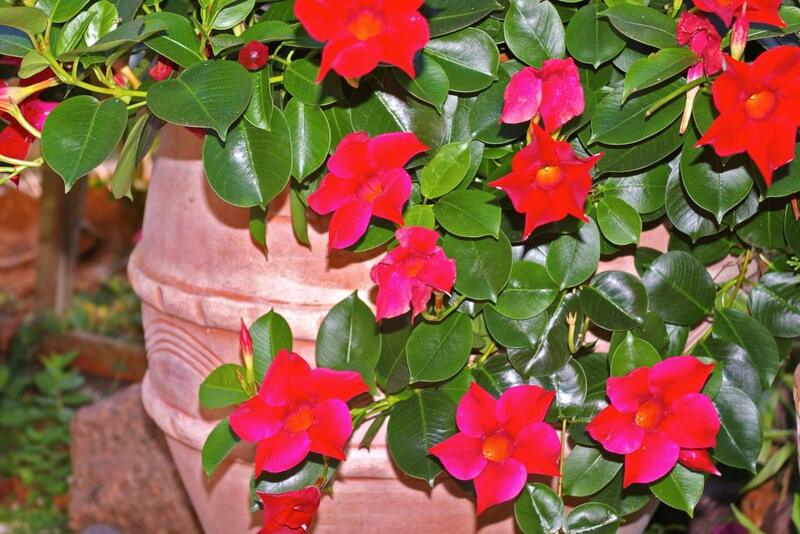 Refer to our advice on how to re-pot your dipladenia. South America is where Dipladenia originated. It therefore requires temperatures of at least 68°F (around 20°C) to thrive. When growing directly in the ground, temperatures must be high in both summer and winter. Planting is done in spring. Direct sunlight is fine when Dipladenia is planted directly in the ground. Dipladenia will die outdoors if temperatures drop under 50°F (10°C) for extended periods of time. To boost flower-bearing, remove dipladenia wilted flowers often (deadheading). It’s a good practice to repot and prune at the same time to only let the plant suffer transplant shock once. Indoors, select a very well-lit space for your dipladenia, but not in direct sunlight behind a window. Water often but in small amounts, to avoid suffocating roots. Finally, bring your dipladenia outdoors from May to October to give it fresh air. When potted, dipladenia requires a lot of moisture. A good trick is to place it on a bed of constantly moist gravel or clay pebbles, since this recreates the moisture found in its its natural tropical environment. The usual blooming season for Dipladenia is March to November. Native to the tropical Americas, Dipladenia is a sub-species of the Mandevilla vine. 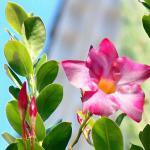 It’s part of the same family as oleander and it blooms in abundance over many months with beautiful flowers. 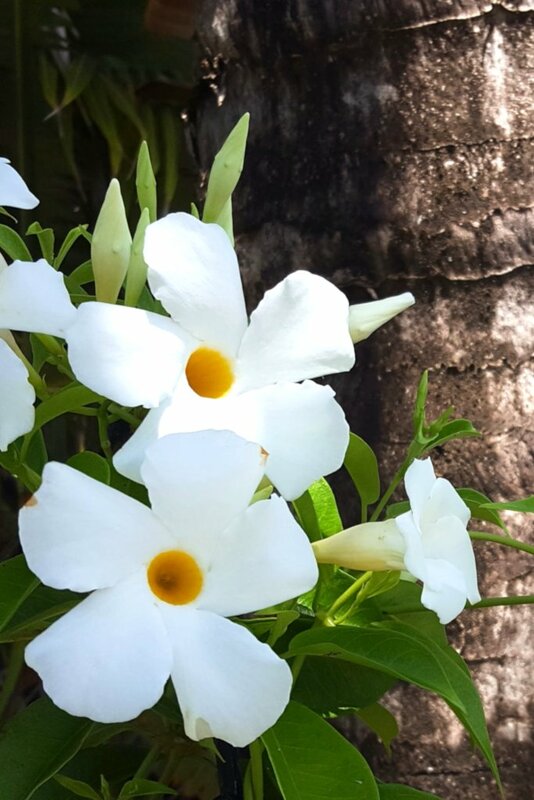 Dipladenia grows best as a ground-seeking hanging vine, although it’s perfectly possible to train it up along a lattice like its cousin, the mandevilla vine. When left untethered, flowers will cascade down from hanging suspensions or balcony railings and produce a marvelous effect. Because of its tropical origin, greenhouses with high moisture levels are the perfect growing environment. 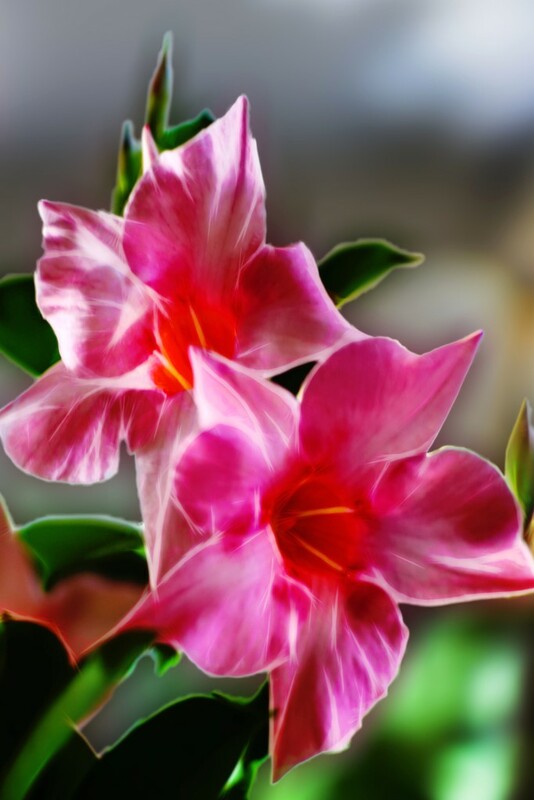 If you wish to grow dipladenia in apartments or indoors, mist leaves often with soft water. You would make your plant happiest if you tried various techniques to increase indoor humidity. Dipladenia is mildly toxic when ingested and is irritating to skin when touched, so wear gloves or wash your hands after handling it. Dipladenia leaves most often turn yellow when they were exposed to the cold or to lack of water. 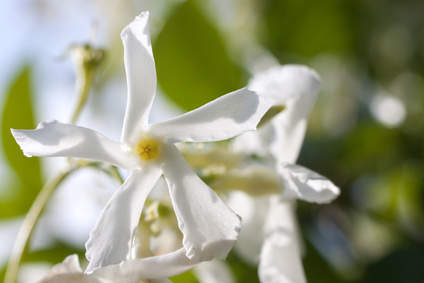 Protect your dipladenia from drafts, especially in winter, and regularly spray water on their leaves. If a cottony white substance starts covering leaves, a scale insect colony has appeared. Dipladenia can also be colonized by mites and ticks such as red spider mites. Hanging suspensions will highlight the flower’s cascading blooms. Adding fertilizer during the blooming period will increase the number and beauty of flowers.